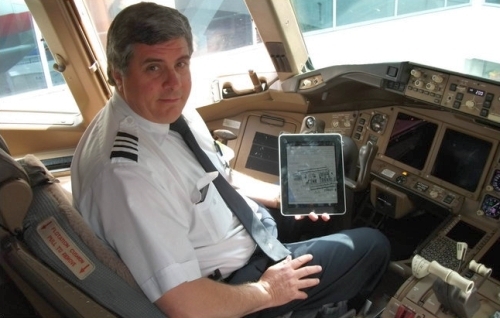 TechCrunch is reporting that American Airlines will be the first major carrier to use iPads instead of paper flight charts. Why, you may ask, are they doing this? Are AA pilots young, hipster types that rely on Apple devices in a proportionally higher amount than the average populace? Not exactly, apparently the elimination of the 35 pounds of dead weight will save the (bankrupt) carrier over a million dollars a year. They are reportedly weighing whether to ban Kevin Smith from all future flights for the same reason.